Spring is in the air and the British larder door is now opening and coming out are a whole number of lovely British vegetables and herbs. The weather is very changeable so most soups do need to have a little punch to them for the chillier days, here you will find ones that easily bridge the gap from cold to heat-wave (typical for the UK). When making a soup, always consider making a big batch and freezing. You will be so glad you did when you want a quick lunch or supper dish. Soups are also perfect for the lunch pack-up and the perfect partner for a picnic (take it warm in a flask to take off the chill if the day is a little cool). 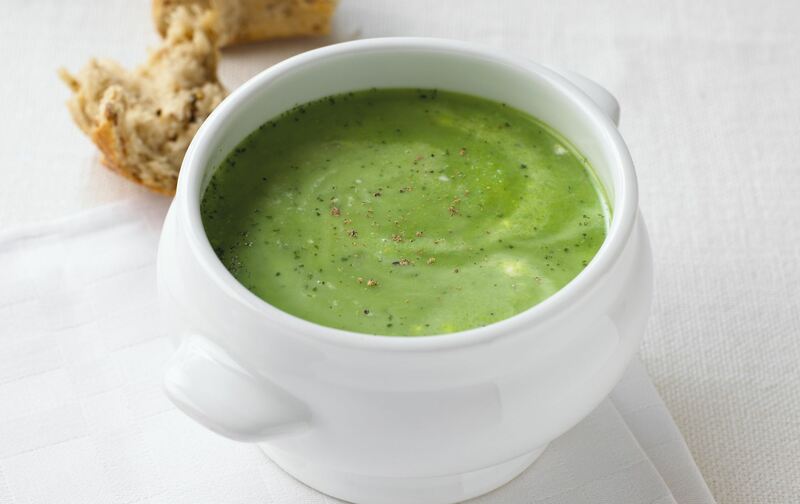 What a classic combination pea and mint soup is, these two were made for each other. The magic of this soup is how quick and easy it is to make, and, the soup is even better if you use frozen peas. What are you waiting for? A slightly heftier soup for a chilly spring day. This spring cabbage soup is one of those which bridges the gap between winter and spring. There are many reasons to celebrate spring, and one of the best is it is British Asparagus season. The season is brief (late April to mid-June) so it is important to make the most of it. What better way than with this asparagus soup and poached egg. Thank you to British Leeks for this lovely, unusual soup. No surprises to the contents of the soup, fresh, new season Welsh leeks and Stilton soup. How lovely, and so easy to make too. A classic soup if there ever was one. This leek and potato soup recipe is just perfect for those chillier spring days served hot and should the sun beat down, then is lovely cold too.